Voted as one of Alaska’s most popular tourist destinations by USA Today 10 Best Series, the Museum of the North attracts over 90,000 visitors each year. The museum opened in 1929, and houses over 1.5 million artifacts and specimens, which represent millions of years in biological diversity and thousands of years of cultural traditions in the North. The museum offers collections across ten disciplines, including, archaeology, birds, documentary film, earth sciences, ethnology/history, fine arts, fishes/marine invertebrates, insects, mammals, and plants. In addition, the museum is a repository for artifacts and specimens collected on in Alaska and is also considered a leader in northern natural and cultural history research. If you’re planning a trip to Alaska to see the Northern Lights, this is another must-see stop during your stay. While there are many reasons to add this museum to your list, here are five major reasons to visit. If you’re interested in beautiful architecture, you’ll love what you see throughout the museum’s building. Designed by nationally recognized architect, Joan Soranno and the GDM/HGA architectural team, the building reflects the beauty of Alaska. With expansive windows to feature surrounding views, visitors can see the Alaska Range, Denali, and the Tanana River Valley. Other areas of the museum were creatively planned, including the Rose Berry Alaska Art Gallery, The Grand Lobby, Collections Gallery, The Place Where You Go to Listen, and more. As we mentioned above, the Rose Berry Alaska Art Gallery is a major reason to visit the museum. In this gallery, you’ll find over 2,000 years of Alaskan art, from locals to visitors, you can see ancient ivory carvings to contemporary sculptures. In addition, you’ll experience art in every medium, with featured pieces such as Sydney Laurence’s painting Mt. McKinley; the Okvik Madonna, a 2,000-year-old ivory carving from the Okvik Eskimo culture of the Bering Strait region; and a photograph by Ansel Adams, Mt. McKinley and Wonder Lake. Did you know that Fairbanks started as a gold mining town? In honor of this part of our city’s history, the museum’s interior gallery features the largest display of gold nuggets in the state in addition to an astounding 36,000-year-old mummified Alaska steppe bison (Bison priscus). This piece was discovered by gold miners in 1979 and was donated to the museum. 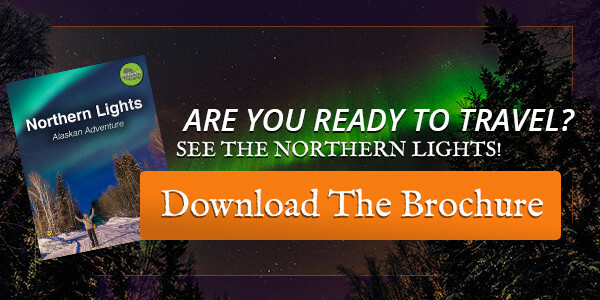 One major reason to visit the Museum of the North is that it will perfectly complement a trip to see the Northern Lights. Learn more about the science, history, and beauty of the Northern Lights in a video and experience the all-sky camera and experiments to discover how and why we perceive the aurora. One unique part of the museum is its outdoor exhibits. The grounds include beautiful sculptures, historical artifacts, and cultural carvings for visitors to discover and explore. A few of these exhibits include the Wolf Totem Pole: Everyone’s Grandfather, the sculpture, Totem, by Bernard Hosey, and Christiane Martens’s sculpture Denali. A few things to note ahead of your visit – make sure you have a minimum of three hours to explore the museum, be sure to download The Alaska App for the museum’s audio tour and decide which galleries you want to see before you arrive.